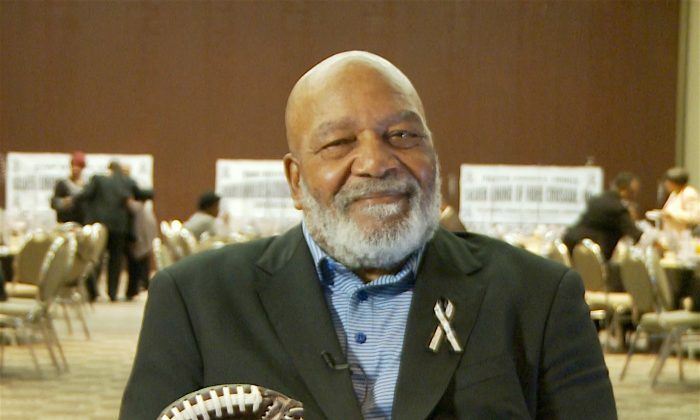 LOS ANGELES, Calif.—At 81 years old, former NFL legend and Hollywood actor Jim Brown is still giving his time and energy to help urban communities and collaborating with those who have similar goals. In 1988, Brown founded the Amer-I-Can Foundation for Social Change, Inc. and created a 60-hour life management and self-improvement training program, particularly targeted towards at-risk youth. The program has changed lives in prisons, juvenile probation camps, middle schools, high schools, colleges, businesses and other organizations. “Amer-I-Can really was created because you had African-Americans killing African-Americans, young men killing young men, and that cannot be allowed. That is something that we have to change,” said Brown, president of Amer-I-Can. Los Angeles has long been known as a major hub of gang activity, with more than 450 active gangs and 45,000 total members in the city, according to the Los Angeles Police Department. 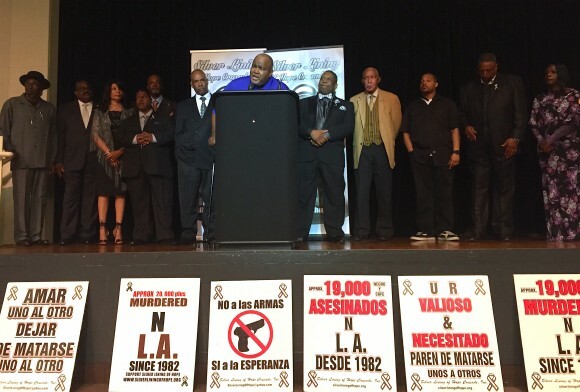 Several decades ago, Brown began organizing meetings in his home with gang members and leaders. Truces were negotiated, many of the gang members turned their lives around, and some even joined the Amer-I-Can organization to inspire others. The Amer-I-Can curriculum focuses on transforming people’s self-doubt into self-determination, or “I-Can’t” into “I-Can,” guiding them to develop and complete goals, and also inspiring them to value their relationships with their families and communities. Brown was honored for his work by representatives of the faith community in Carson, Calif. on Apr. 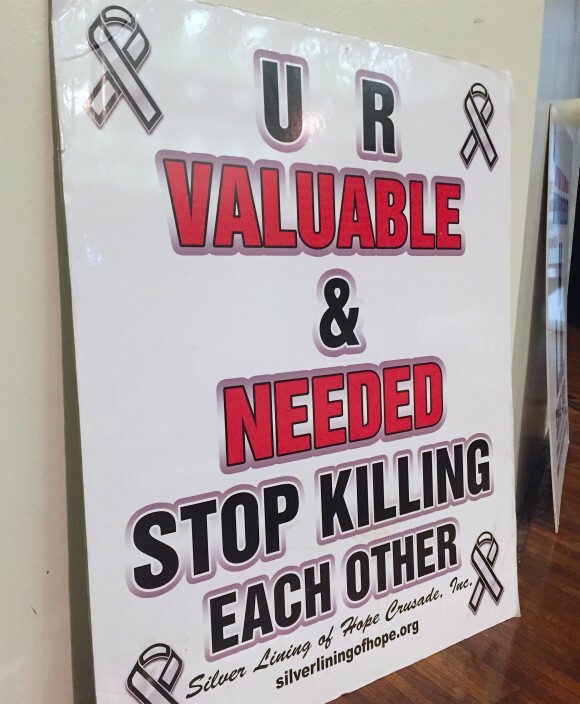 7, by members of Silver Lining of Hope Crusade, an organization that was started by Pastor Winford Bell to bring awareness to violent crimes affecting the community. Pastors with Silver Lining were recently trained to become facilitators for the Amer-I-Can curriculum in order to hold classes in local churches. The pastors were trained by Rudolph “Rock Head” Johnson, a former Compton Crip gang member who has spent 17 years in jail. For the last 20 years, he has worked hard to make up for the negative things he’s done in his life. John “Apollo” Payne is a former high-ranking gang member with the Bloods gang, who now also works with the Amer-I-Can organization. “It should be in every school, in every institution in the world, because it works,” said Payne. Brown met directly with President Donald Trump in December to discuss ways to benefit the African-American community, and he returned with high praise for the support shown by the new president. Trump’s Diversity Coalition also pledged funding for the Amer-I-Can Foundation, and the organizations held a fundraiser and pre-inauguration party in Washington, D.C. on Jan. 19. Brown said that local faith communities will also be able to bring additional support to his Amer-I-Can program. “There’s a practical aspect and intelligent aspect, but we need the spiritual aspect also, because ultimately you have to believe in something other than yourself,” said Brown. During his eight-year football career as a running back with the Cleveland Browns starting in 1957, Brown helped the team win an NFL championship and was named the NFL Most Valuable Player several times. Brown was later named the greatest professional football player ever by The Sporting News magazine in 2002.